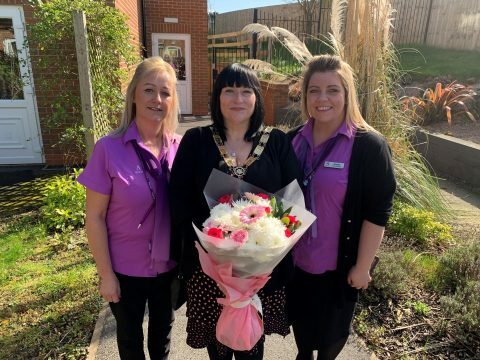 Yesterday, Deputy Mayor Cllr Amanda Cartwright with other Kidsgrove Town Councillors visited Maple Tree Court Care Home in Kidsgrove. Mark, the Kidsgrove Ranger, also attended. Mandy and Shellie in the photograph are staff at the home. Councillors were given a full tour of the facility and got to meet many of the local residents. The non-for-profit company Anchor who run Maple Tree Court have offered to work more closely with Kidsgrove Town Council and they’ve offered to engage more with our community events. Defibrillator Mapping Exercise – We need your help! Crown Bank Allotments working with Father Hudson’s Care – Can you help?